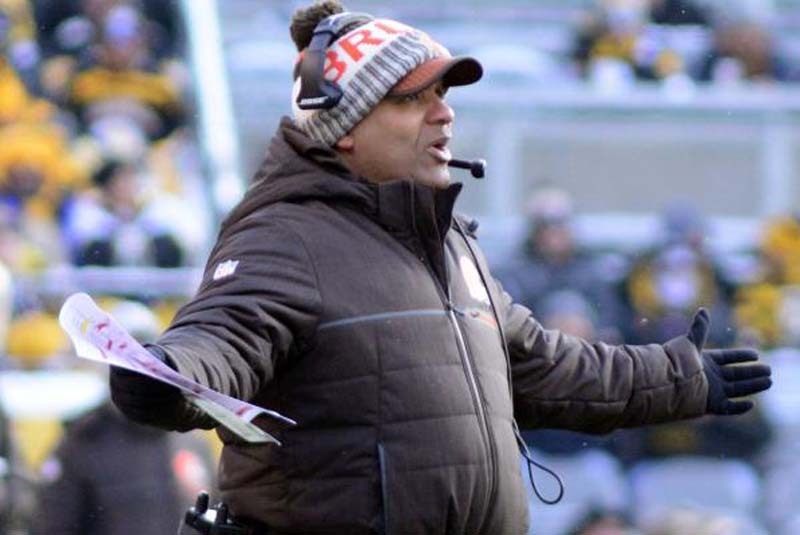 Pressure is going to be on head coach Hue Jackson to produce early after going 1-31 the past two years. The schedule-maker did him no favors. The Browns host the Steelers in their season opener and then play the Saints in New Orleans on Sept. 16. Their next three assignments are a home Thursday night game against the Jets, a game in Oakland and a home game with the Ravens on Oct. 7. Jackson could be on thin ice if he isn't at least 2-3 by then. --Linebacker Mychal Kendricks was a late addition to the Browns roster. He was signed on June 3 after most of OTAs had been completed. Defensive coordinator Gregg Williams isn't worried about Kendricks playing catch-up in training camp. [post_ads]"I think he fits in perfectly here," Williams said. "One of the things that we do here is every player has to play more than one position. That's how we have the flexibility of the 'next man up' during the season and how you play the next best athlete, not the next best on the depth chart. It's the next best athlete. Kendricks fits into that role. He's a multiple-position player. He's able to play inside and outside." Kendricks played the last six seasons with the Philadelphia Eagles. --The Browns signed Donald Stephenson on March 15 hoping he could compete for a starting job at left tackle. He never practiced with them. He was suspended by the NFL for two games for violating the league's substance abuse policy. Stephenson chose to retire instead. It isn't a critical blow to the Browns, but they wouldn't have signed him in March if they didn't think he could help. --Rookie Damion Ratley might have to make an early impression in training camp to get significant playing time in preseason and thereby increase his chances of making the final roster. "He's made some plays," head coach Hue Jackson said. "He's still a young guy who's learning how to play, learning how to line up. Again, that's to be expected right now, but I think he has talent," Jackson said. "He can catch. He can run. I think once he figures out that part of it of where to be and when to be there, then his athletic ability will show." Ratley has size going for him. The 6-foot-3 product of Texas A&M was a sixth-round draft pick by the Browns in 2018.